Secretary-General Ban Ki-moon briefs the General Assembly. United Nations Secretary-General Ban Ki-moon today announced the members of a High-level Panel to advise on the global development agenda beyond 2015, the target date for achieving the anti-poverty targets known as the Millennium Development Goals (MDGs). “I have asked my High-level Panel to prepare a bold yet practical development vision to present to Member States next year,” Mr. Ban said in a news release. The Panel will hold its first meeting at the end of September, in the margins of the annual high-level debate of the General Assembly. It is expected to submit its findings to the Secretary-General in the first half of 2013, and those findings will inform his report to Member States. “I look forward to the Panel's recommendations on a global post-2015 agenda with shared responsibilities for all countries and with the fight against poverty and sustainable development at its core,” Mr. Ban said. 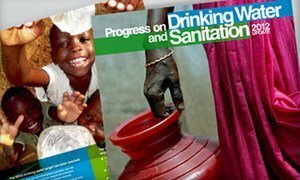 According to a recent study – the 2012 Millennium Development Goals Report – progress has been made in some areas, with three important targets on poverty, slums and water met three years ahead of 2015. It added that meeting the remaining targets, while challenging, is possible – but only if Governments do not waiver from their commitments made over a decade ago. The High-level Panel is part of Secretary-General Ban's post-2015 initiative, mandated by the 2010 MDG Summit, at which UN Member States took stock of the progress made in achieving the MDGs. Member States have called for open, inclusive consultations – involving civil society, the private sector, academia and research institutions from all regions, in addition to the UN system – to advance the development agenda beyond 2015. The work of the Panel will reflect new development challenges while also drawing on experience gained in implementing the MDGs, both in terms of results achieved and areas for improvement, according to the news release. The Panel's work will be closely coordinated with that of the intergovernmental working group tasked to design Sustainable Development Goals (SDGs), as agreed at the UN Conference on Sustainable Development (Rio+20), held in Rio de Janeiro, Brazil, in June. Rio+20 was attended by some 100 Heads of State and government, along with more than 40,000 representatives from non-governmental organizations, the private sector and civil society, all seeking to help shape new policies to promote global prosperity, reduce poverty and advance social equity and environmental protection. At the end of the gathering, participants agreed an outcome document which called for a wide range of actions, such as beginning the process to establish SDGs. The High-level Panels' three co-chairs are: President Susilo Bambang Yudhoyono of Indonesia; President Ellen Johnson Sirleaf of Liberia; and Prime Minister David Cameron of the United Kingdom. The remaining 23 Panel members are: Fulbert Gero Amoussouga of Benin, Vanessa Petrelli Corrêa of Brazil, Yingfan Wang of China, Maria Angela Holguin of Colombia, Gisela Alonso of Cuba, Jean-Michel Severino of France, Horst Kohler of Germany, Naoto Kan of Japan, Queen Rania of Jordan, Betty Maina of Kenya, Abhijit Banerjee of India, Andris Piebalgs of Latvia, Patricia Espinosa of Mexico, Paul Polman of the Netherlands, Ngozi Okonjo-Iweala of Nigeria, Elvira Nabiullina of the Russian Federation, Graça Machel of South Africa, Sung-Hwan Kim of the Republic of Korea, Gunilla Carlsson of Sweden, Emilia Pires of Timor-Leste, Kadir Topbas of Turkey, John Podesta of the United States of America, Tawakel Karman of Yemen. In addition, the Secretary-General's Special Advisor on Post-2015 Development Planning, Amina J. Mohammed, will serve on the Panel in an ex officio capacity. A group of United Nations independent experts today urged States to intensify efforts towards realizing the anti-poverty targets known as the Millennium Development Goals (MDGs), stressing that there is no room for complacency with only three years to achieve them before the 2015 deadline.